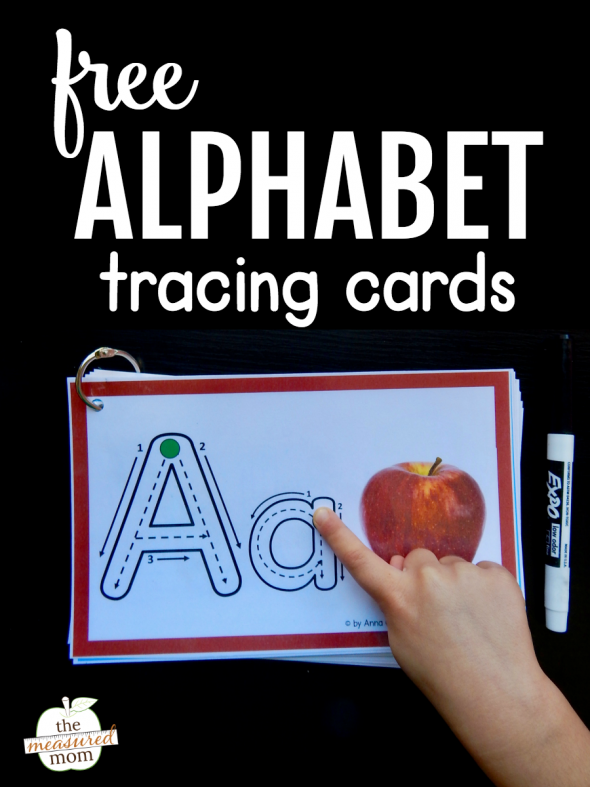 Help kids remember letters with this free alphabet tracing book! Today I’m sharing a free alphabet tracing book, perfect for kids who are struggling to learn letter names. 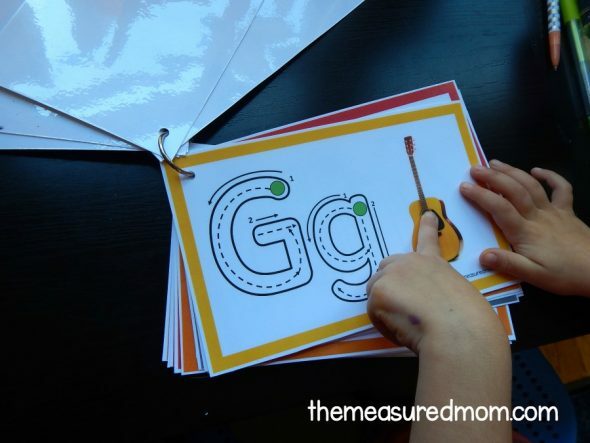 If you have students who struggle to remember their alphabet, this post is for you! I created the book for my three-year-old. 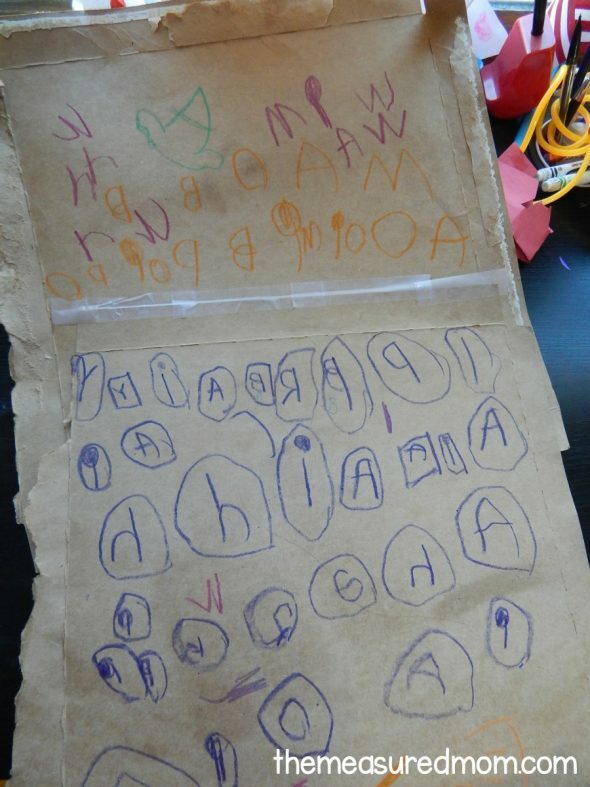 She knows all of her uppercase letters and at least half of her lowercase letters by sight – but she’s developed her own way of writing letters. However, I’m realizing that the more she writes those letters her own way, the harder it’s going to be to teach her correct letter formation. She’s not ready for worksheets. What’s a mama to do? The alphabet tracing book is my answer! It’s a collection of cards with an uppercase letter, lowercase letter, and picture cue on each one. Each letter has a green dot to show the child where to begin tracing. You’ll also notice that each letter has arrows to show you how to correctly form the letter. When I say you, I mean the adult. I don’t expect my toddler or even an older child to know how to follow those arrows to write the letter. 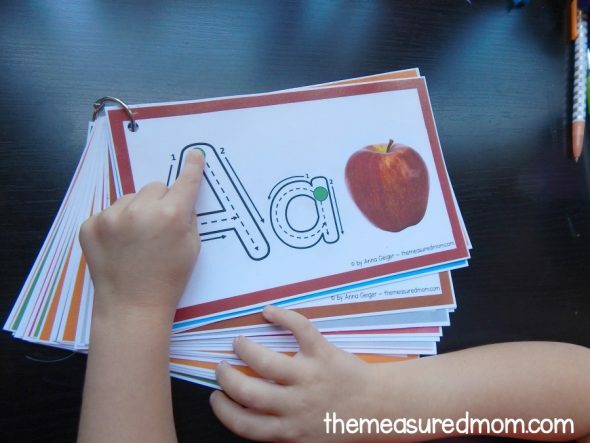 But you can use them as a reference when showing your learner how to form the letter. 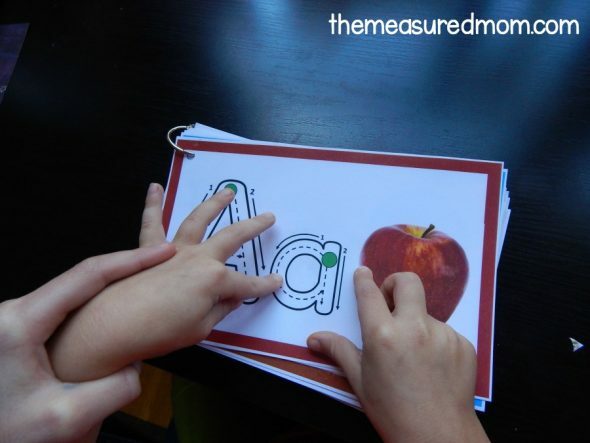 As you can see, I recommend that you hold the child’s hand as s/he is learning to form the letters correctly. You’ll probably find that your learners don’t need guidance with some of the easier letters, like this one. 1 – Have the child trace each letter with a finger. Remind him/her to start at the green dot and go down (or around, depending on the letter). If necessary, hold the child’s hand for proper letter formation. If you’re doing these with a preschooler, as I am, you can expect that they will not have the stamina to go through the entire book. After letter H, my daughter told me that she’d had enough. Make sure you laminate the cards and put them on a ring for durability and ease of use. If you’re doing the cards in a classroom setting, have a tutor or aide work with the learner to do the entire stack at least once a day. If a learner knows fewer than ten letters, start small. Have him/her trace only the letters in his/her name and the letters s/he knows for a month before doing the entire stack. If your focus is letter recognition, have your learners use their finger and not a dry erase marker. 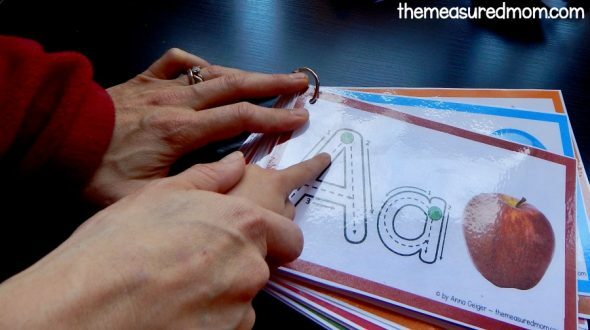 It’s the tactile experience that helps learners remember the letter names. If you’d like to learn more about the letter tracing book, you can read about it in Jan Richardson’s book, The Next Step Forward in Guided Reading. She’s been using alphabet tracing books for twenty years and has some great data to show how well they work! © 2017 – 2019, Anna G. All rights reserved. This resource could not have come at a better time! Thank you so much! I am currently reading Jan Richardson’s book (which is wonderful!) and trying to pull together the best resources to meet the differing needs of my kindergarteners. I googled alphabet tracing books tonight and did not find what I was hoping for. Then, your email with this resource arrived a few hours later… perfect timing! Thanks again for creating such awesome resources! I love that! So glad you can use these, Jessica! Thank You so much for this – I have a few children that will really benefit from this…. As you say it is much easier to start from scratch before they get into bad habits..
I’m so glad you can use them, Fiona! Thank you for your wonderful resources and especially for providing so many free ones! I love the resources that have actual photos! As a grandmother, with 2 4yr old grands that come for “play dates” once a week, I so appreciate that I can use so many of your resources to make our time fun, educational, and memorable without breaking the bank! May God abundantly bless you and your family. These look great but would like the J with the top line off. Thank you for the feedback, but I won’t be modifying this free printable. Thank you seems so small for all you’ve done but it is MUCH appreciated. You’re very welcome, Dominique! Thank you so much for the kind words! Thank you for this! I am a kindergarten teacher and read about tracing books last year (and started them then). 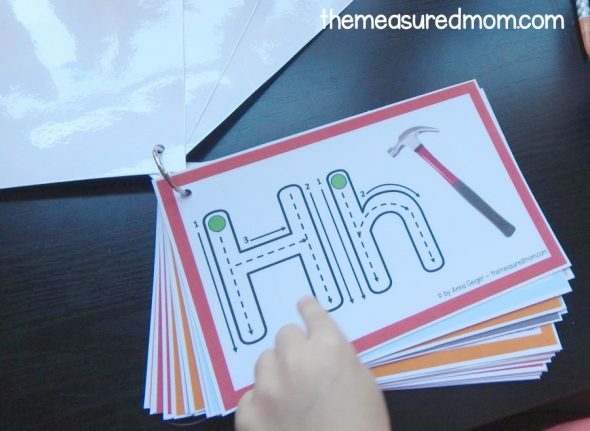 This year I will be starting them earlier, and I like how your tracing books shows the correct letter formation, making it easier for parent volunteers or 5th grade helpers to use with the students. You’re very welcome, Jennifer! I hope you find many helpful resources on my site. I speak frensh ! It’s that possible to have your work for change the picture with frensh words ? I’m sorry, Laure, but due to limits on my time I only provide my resources in English. Thank you so much for these. They are going to be a wonderful addition to activities in my classroom. My students will benefit greatly by these. Your pictures are fantastic. You’re very welcome, Nancy! Thank you so much for the kind words! Thank you very much for these!! I am a reading teacher and have been helping the kindergarten teachers with students that are really behind. This will help me to show those students how to make each letter. 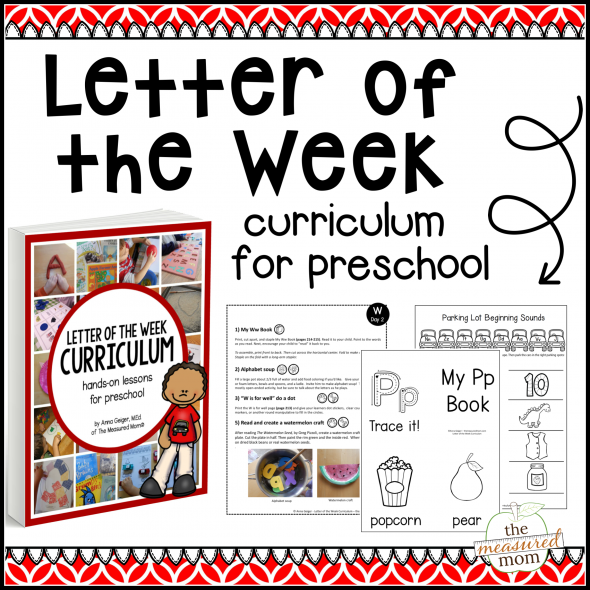 It will also be a great resource for those that need a reminder on how to write the letter! You’re very welcome, Kim! I hope my resources work well for you and your students. Thank you so much. I have started with a small homeschool and this will help me alot. Thank you for your amazing resources. I am a Teacher Aide and its always good to have something up my sleeve in case students require extra work. I am also gathering some resources for next year when i work with a special needs student. These resources (play based and games) are perfect. You’re very welcome, Natalie! I hope you find many helpful resources on my site. This a great resource! Thank you! I printed them off to use with my 4-year old at home for his preschool. This is perfect! Just what I was looking for! He’s not ready yet to write his letters with a pen, but tracing activities and writing letters in salt are perfect. Thanks! You’re very welcome, Erica! I’m glad it works for your son! Thank you for sharing. I will be able to use this. Very soon! I would need more details to know how to help you. Hi, I am also a teacher and want to say thanks to you for sharing such great resources for parents and teachers. I created a separate folder with ‘The measured mom’ at my PC desktop because I use your printable for my early year classes. Keep it up with your great effort!! You are so amazing. I have been searching for resources and games to make learning fun with my preschool class and every time I find something I want on Pinterest, it brings me right back here to your site! I need to remember to come here first and skip Pinterest all together because you have EVERYTHING! Your printables are beautiful and the fact that most things are free makes me love you even more. Thank you so much for your time and talents. I hope you are receiving blessings from heaven- because you are a blessing to me! Wow…thank you for sharing these great resources for free! Hi Anna, I really like many of the resources you make. They are useful, bright and with simple design. 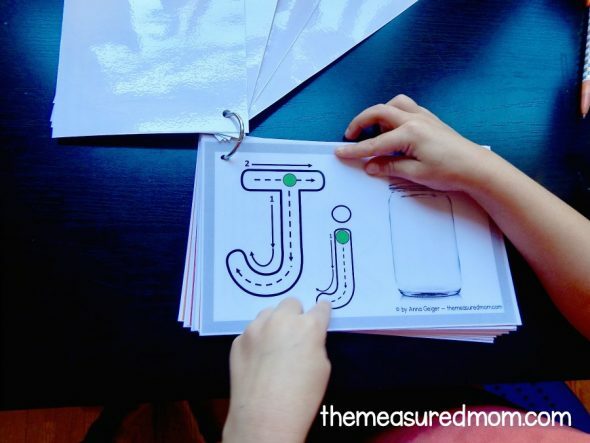 I would like to download the Alphabet Tracing Book for upper and lower-case letter writing. However, I wondered if you could alter the upper and lower-case ‘Yy’. We use SA Font and teach the letter to have a rounded body and tail and the lower-case to (have its tummy) sit on the line. TIA! Unfortunately, I can’t. I used purchased clip art for the letters, and I had to use what came with the set. Hi, Anna! You are a heaven sent! This site is such a big help for struggling moms like me, who do not know where to start and how to start! I’ve learned a lot from this site. Keep it up! Thank you so much! thank you so much im really enjoying the abc tracing book the kids love it! First I’d like to thank you for all the wonderful stuff you have on your site…I can’t tell you how much it’s been helpful teaching my kids as well as our homeschooling co-op. I’m sorry, that isn’t something I can make time for right now. Thanks for understanding! What a brilliant resource. Thank you. where can I get the resources? where’s the link ? Click on the big green button that says “Click here to get your free printable”. What’s happening when you click on the green button, Jessie? You should see a pop up where you enter your information, and then you will get the file in your inbox. I am having the same issue. I would love these, but everytime I click and then enter my information, it jumps to an ad for another one of your wonderful collections and says to check my email. It has not come in an email and does not appear in your resources that come with the passcode. I have also tried your troubleshooting techniques, but it has not worked since it is a subscription link. If there is another way to get these I would truly appreciate them. Thank you for your hard work. This is Kate, Anna’s assistant. I’m sorry you’re having trouble, and thank you for describing it so clearly. I just tested it with my yahoo address and it worked. So I think you should check your gmail spam folder. Gmail is great at weeding out spam, so that could be where it went. If that doesn’t work, I would try a different email address. Sorry for the inconvenience! This is Kate, Anna’s assistant. I just tested this with my own email address, and it worked. After you enter your email address, you’ll be sent the email right away. In the email, click on the blue link that says, “CLAIM YOUR OFFER.” Enjoy your free file! I cannot download too. I put my email but not worked. The link you have sent me is also not reached here again to download. I prefer the previous that you just give the direct link to download. Thanks. Hi, where is the link to download the trace book please?